I don't make Chinese food at home very often, when we eat Chinese at home it is usually from Pei Wei or a local Chinese take-out restaurant. However, I decided to give it a try! I found a recipe online here and then modified it to the recipe that is below. They gave a tip to make your chicken tender and I had never heard of it before. Marinate your chicken in baking soda! It eliminates any odor that the chicken may have and makes it more tender. You just have to rinse the baking soda off before then marinating it again, before cooking. 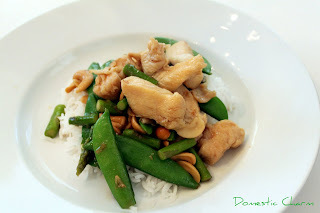 Usually cashew chicken has bell pepper and onion in it, but I chose to add asparagus and snap peas instead. It was really yummy and the sauce was very light and flavorful. Marinate the chicken meat with the baking soda for 15-20 minutes and then rinse the chicken thoroughly making sure that all of the baking soda is cleaned off. Pat the chicken dry with paper towels and then marinate with the corn starch and rice vinegar for 15 minutes. Mix the sauce together and set aside. Heat up a wok with 1 tablespoon of cooking oil and stir-fry the chicken meat until the color turns white or half-cooked. Remove from the wok and set aside. Add another 1 tablespoon of cooking oil into the wok and add the asparagus and snap peas. Stir-fry for 1-2 minutes and then add the chicken back in. Add in the cashews stir. Add in the sauce and stir continuously until the chicken meat is cooked. Add salt to taste, dish out and serve over steamed white or brown rice.